Flowers. In India – flowers are everywhere. In the streets, in the temples, in the richest and in the poorest of houses, on the gods, in the hair, flowing on the rivers, carried gracefully on the necks – intoxicating with their smell, hypnotising with their colours. India is the world’s largest flower producer, but alike other players in the market it is not the cut flowers export that makes it thrive. Flowers are an integral part of the Indian culture and of an everyday life – no day in a temple, no religious ceremony or a day of significance goes without a flower garland, and its meaning is much deeper than just a sheer decoration. In temples, flowers are used for worshipping, and you will always see a fresh garland resting on the gods’ and goddesses’ necks. If you are planning a temple visit yourself and want to pay respect to the gods – bring a flower. Using flowers for religious purposes one should be careful though, as different gods prefer different flowers, and many garlands include leaves, grass and sometimes even fruits. Yesterday, when I was leaving my yoga shala, I stumbled upon a fellow student, who was patiently picking young grass next to the shala entrance. “It’s for Ganesha”, – she said. “You see, he likes it. So little he likes, and even that we don’t give”. For the love of Ganesha to Arukam grass, it is the plant which is always used for his worship. In everyday life garlands are used to greet important guests at functions, to decorate houses on special occasions, or in some provinces it is commonly used as an every day garment for women’s hair, which can also serve as a replacement for perfume thanks to its beautiful smell. During the wedding ceremonies thick flower garlands, typically made from roses and jasmine, play a central role as they symbolize acceptance by a groom and a bride of each other, just like rings in the West. All performers of classical Indian dances always wear flowers as well, which serve both as a decoration and as a sacral symbol. When you watch masters creating their flower masterpieces it sometimes looks like a meditation, as if a Buddhist monk was moving prayer beads, but with a cosmic speed. Funnily, the world’s largest garland of 5 miles was created by meditation students in honour of one of the Indian spiritual leaders – that garland, however, has little to do with the real Indian floral art. Weaving flower garlands is not an easy art and the mastery of required skills has been developed in generations, and will be passed to generations to come. The weavers posses unique knowledge of patterns which you will not see anywhere else in the world, like a flower petals folding technique, which makes them look just like precious stones. In certain temples and religious communities the art of garlands weaving requires not just artistic skills, but also a profound knowledge of a sacred process. Thus, in Srirangam Ranganathar temple the garlands can only be made by the temple lord devotees (sattharars), who never marry and dedicate their whole life to lord Ranganatha. They adhere to specific rules, including that the flowers should be picked in the morning after taking bath, they should not be smelled by anyone, the Lord’s name should be continuously repeated when picking them etc. Mysorean flower market is not even among the biggest in India, but when you enter it, it overwhelms you with its smells, colors and action. 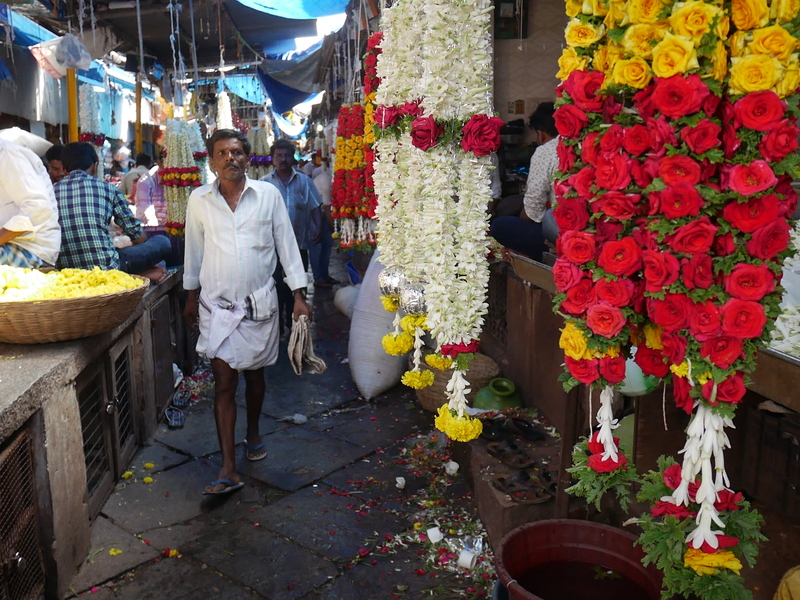 Roses are sold by kilograms here, marigolds move in bags which are bigger in size than me, and both business and garlands weaving are done at the same place, simultaneously. Everyone is so busy that you can easily dissolve in the crowd, as a yet another irritating tourist with a camera. 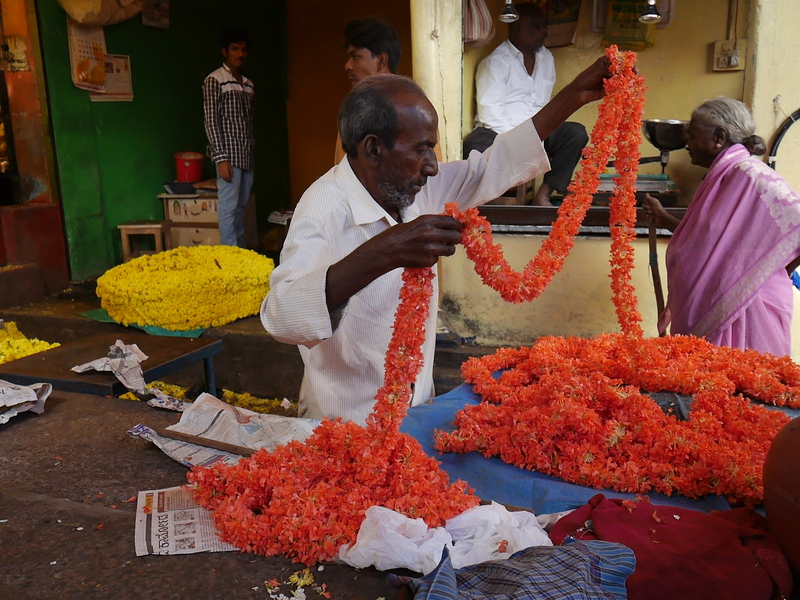 If you are in Mysore, or in any other Indian city – don’t deprive yourself of the pleasure, pay a visit to a real Indian flower market. I need to add something similar to my India itinerary when I make it back there! Great pics! Amazing! I didn’t even know that India is the largest flower producer in the world. The flower arrangements look like the ones they prepare too in the Philippines. 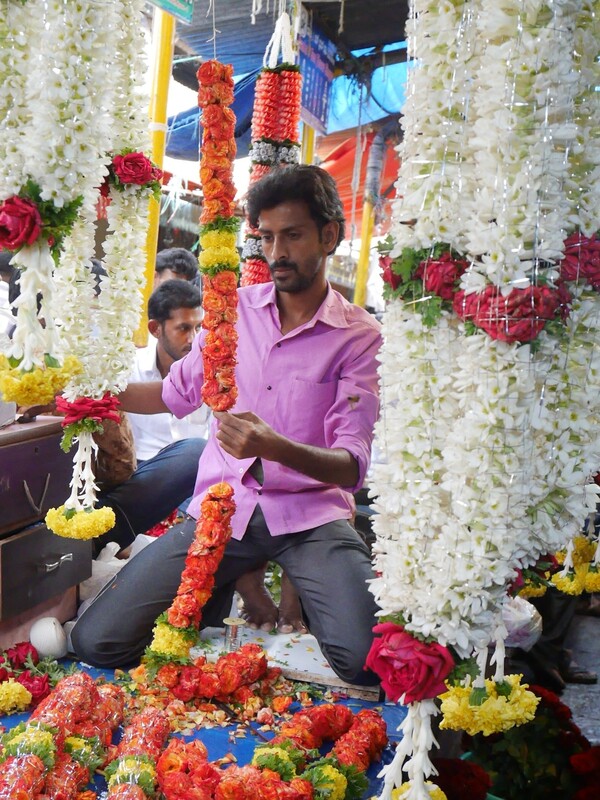 It is amazing the skill involved in creating these garlands. It’s cool that these skills have been passed down by generations. I’d love to visit one of these markets one day! I’m thinking of planning a trip to India soon, so enjoyed coming across this post. Your photos make me want to start planning my trip now! How fascinating. Would never have known India was the largest producer in the world for flowers. It’s interesting to see how beautifully the flowers are designed for the various ceremonies. 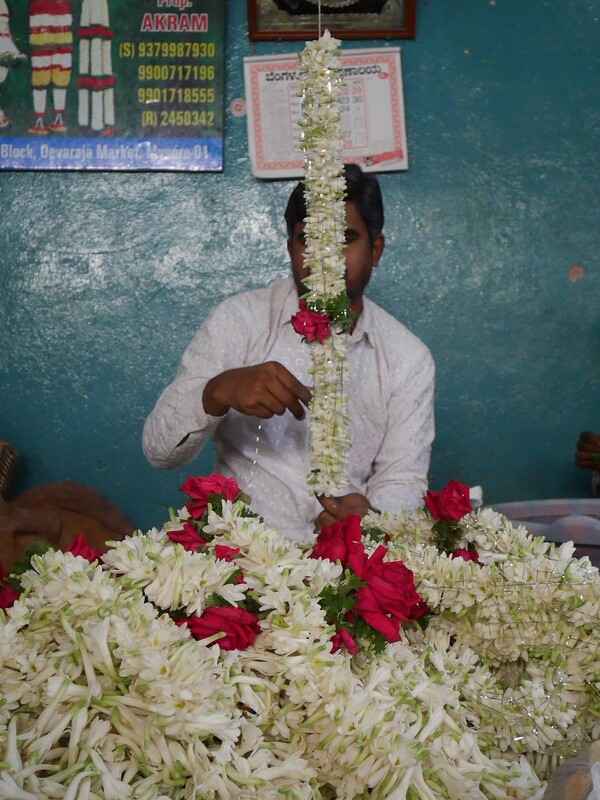 Great article and thanks for sharing a slice of a real Indian flower market.